This study examined whether or not weight, density, and Young’s modulus can be accurately measured by vibration test without weighing beams for timber guardrails. Bending vibration tests with and without the concentrated mass were performed on small clear round bars without the pith of spruce and cedar and on actual size round bars with the pith of cedar for the timber guardrail. The following results were obtained. The vibration method with additional mass could be applied to the round bar as well as the rectangular bar. It is possible that resonance frequency was decreased by the sawn split in the horizontal tapping. It is believed that the free ends condition is easier to realize than the fixed ends condition for cross beams for timber guardrails. The weight of the cross beam for the timber guardrail could be accurately estimated by the vibration method with additional mass under several testing conditions. 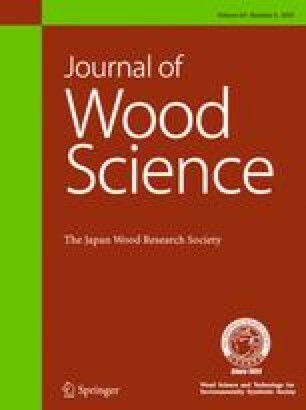 This study was presented in part at the 68th Annual Meeting of Japan Wood Research Society, Kyoto, March 2018. This study was supported by JSPS KAKENHI Grant number JP15K07522 and Research grant #201805 of the Forestry and Forest Products Research Institute.